Are you tired of scaling your roof to clean your gutters? 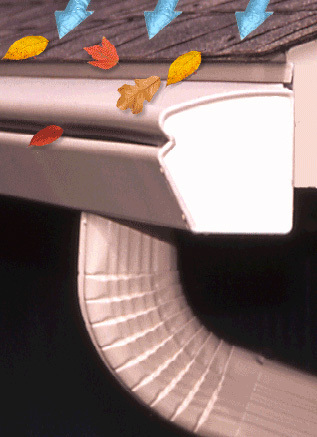 Do you wish there were a way to keep the leaves out of your gutters so that water could move freely? Minnesota Leafless Gutters has a solution for you: gutter guards. With our gutter guards, you can have covered gutters all year round, ensuring that, no matter the season, your gutters stay protected from the elements and falling debris. We’ll install gutter covers with brand new gutter systems or on the gutter system you already own, matching the color and material of your gutters so that you don’t have to replace your gutters just to invest in gutter guards. Our St. Paul, MN seamless gutter installation company provides gutter guards and gutter guard installation services all over St. Paul and Minneapolis, Minnesota, servicing the entire Twin Cities area. If you’re unfamiliar with gutter guards, you’re in for a pleasant surprise that will leave you wishing you hadn’t spent the last few years climbing up and down your ladder to clean your gutters. Gutter guards are simply gutter covers, designed to allow water to flow freely. With only a small amount of space between your roof and gutters left open, gutter covers ensure that leaves and other large debris are unable to enter your gutter system, keeping it clear for the free flow of water. Gutter covers come in a wide variety of colors and materials, perfect for any home’s design or gutter system. Gutter covers have several benefits, including keeping your gutters clear for less frequent gutter cleaning, but the most important is their ability to ensure you have a long-lasting gutter system. Because gutter guards have the benefit of keeping leaves and large debris out of your gutter system, you can be sure that any water entering your gutters isn’t trapped by debris. Water buildups in gutters can occur when you have clogged gutters, where leaves, seed pods, and muck have built up and created small dams or wells of water that can’t drain properly. When your gutters have buildups that aren’t cleaned properly or frequently enough, your gutters can sustain water damage, leaking, rusting, or breaking from the pressure. Gutter guards prevent any of this from happening, ensuring that water flows and drains from your gutter system without getting trapped along the way and causing water damage. If you’re looking to cut down the amount of time you spend cleaning your gutters, ensure that your gutters last as long as possible without water damage, and work as effectively as possible to drain water from your roof and into the ground, invest in our gutter guards. With covered gutters, you can’t go wrong, and with the custom gutter guards from Minnesota Leafless Gutters, you can be sure that you receive affordable gutter covers. Contact our St. Paul, MN gutter installation company today at 612-221-0362 or mnleaflessgutters@gmail.com to see the benefits of gutter guards for yourself.